Here are some posters and postcards from productions of some of my plays. 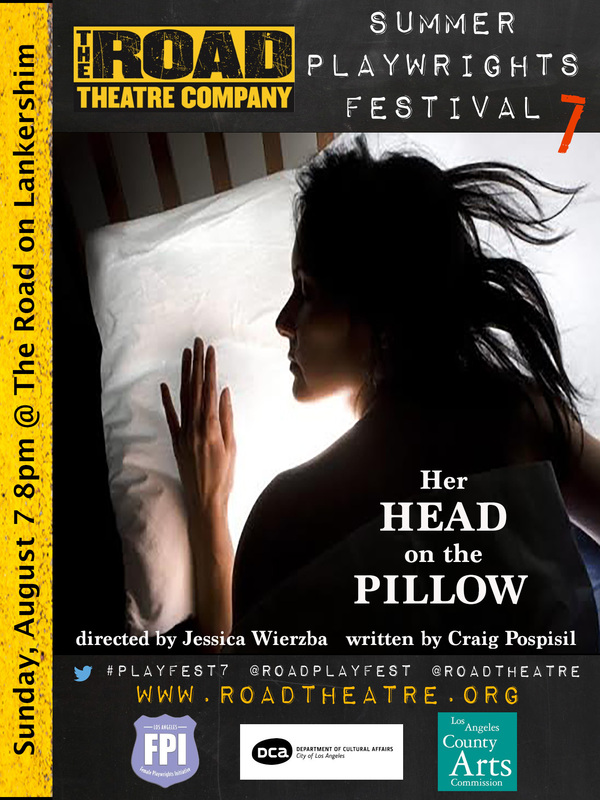 This is the poster created for HER HEAD ON THE PILLOW at the Road Theatre Company's 7th Annual Summer Playwrights Festival in North Hollywood. 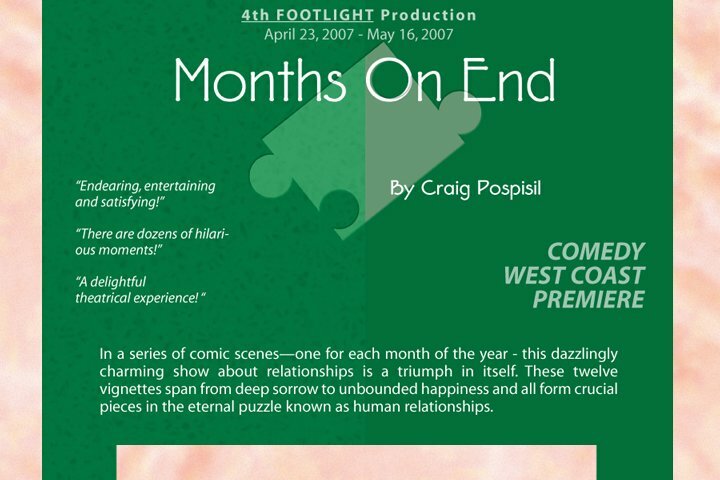 This was the logo the Purple Rose Theatre Company in Chelsea, Michgan used for the programs and posters for the premiere production of MONTHS ON END. 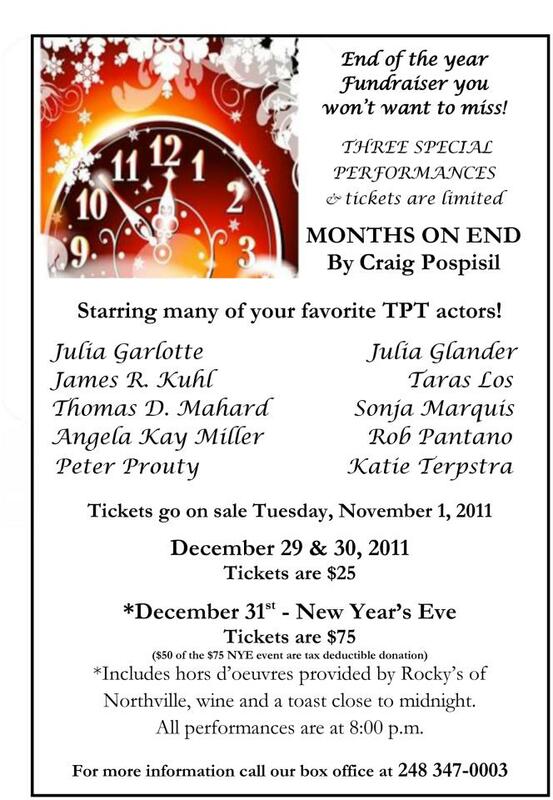 Here is the Tipping Point Theatre's poster for their December 2011 production of MONTHS ON END. 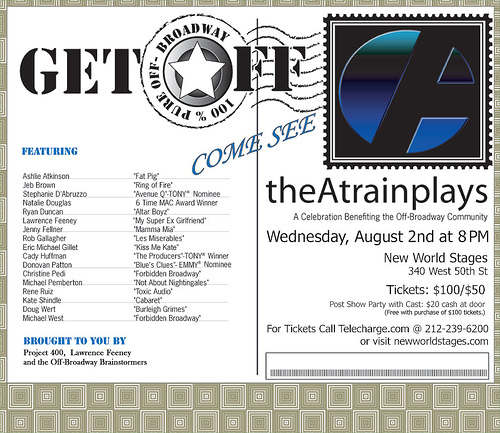 This was the postcard from the August 2006 edition of theAtrainplays. My cast for this show included Cady Huffman, Tony Award winner for The Producers, Stephanie D'Abruzzo, Tony Award nominee for Avenue Q, and Jeb Brown from Ring of Fire. They were amazingly wonderful, talented and gracious to take part. THE DUNES from the production at the Gallery Players in Brooklyn. 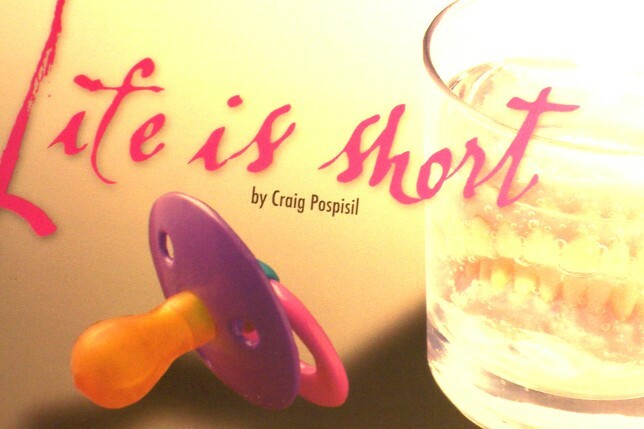 Here's the poster from the production of LIFE IS SHORT at Miami Dade College. 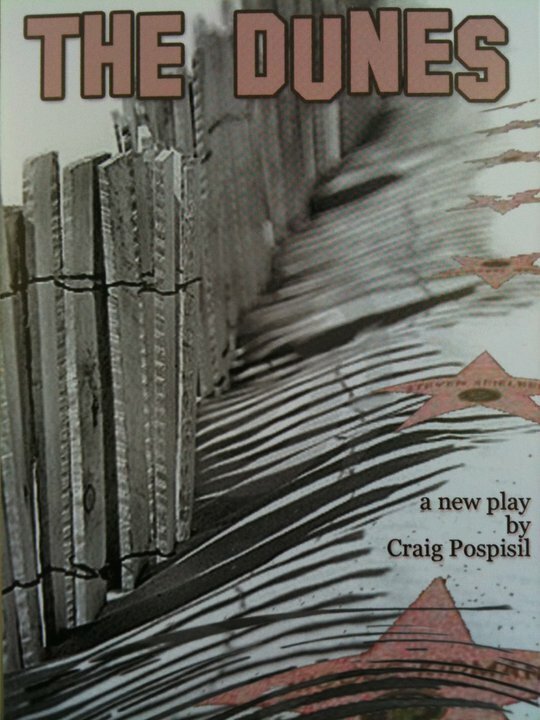 The art work for Theatre 40's 2007 production of MONTHS ON END in Los Angeles. Beverly Hills to be exact. FREE at Rogue Machine's "Shorts and Sweets" in August 2009. 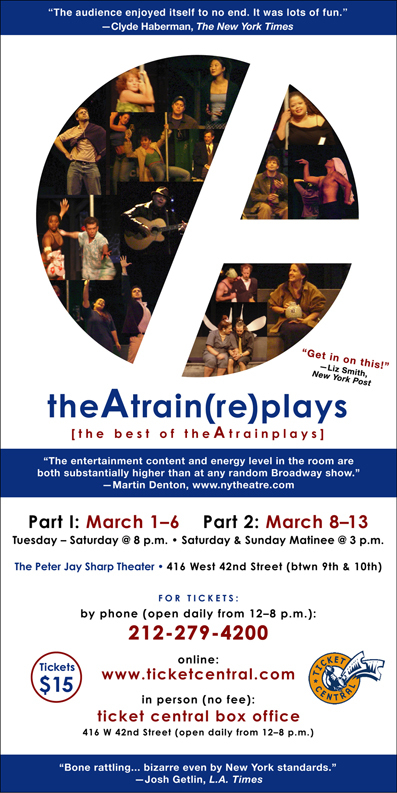 The promotional flyer for theAtrain(re)plays from March 2005. The (re)plays featured my plays IT'S NOT YOU and FREE and my musicals WEDDING TRAIN and DEATH TAKES THE A. 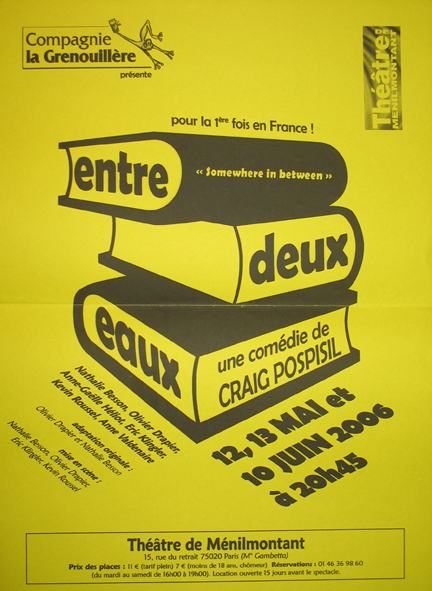 The poster for Entre Deux Eaux, the French translation of SOMEWHERE IN BETWEEN, which was produced in Paris in May and June of 2006. 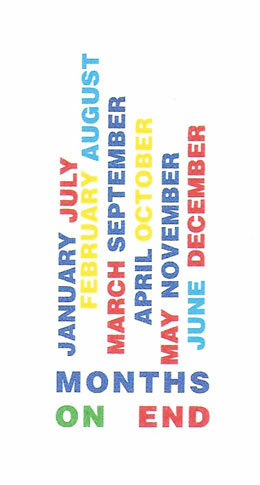 A great poster for a production of MONTHS ON END at Noisy Mime Theatre in London, Ontario last summer. 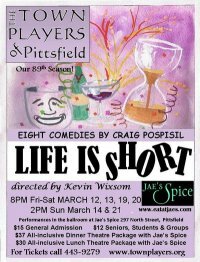 My collection LIFE IS SHORT at the Town Players in Pittsfield, Massachusetts in the heart of the Berkshires. 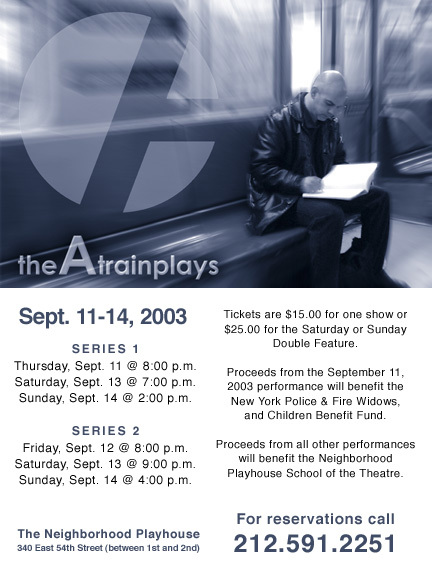 theAtrainplays, Volumes 8 and 9 from September 2003. 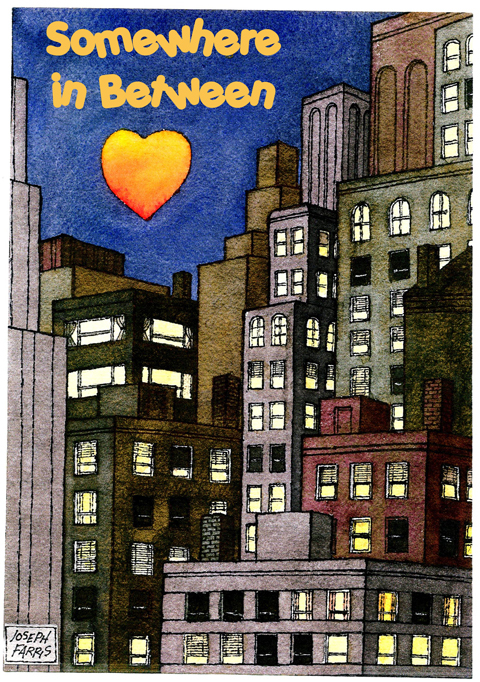 I wrote THE PURPLE PROSE OF MANHATTAN for Volume 8, starring Tracie Thoms, Kakatsakis and Bill Dyzel. SOMEWHERE IN BETWEEN at Truman University. 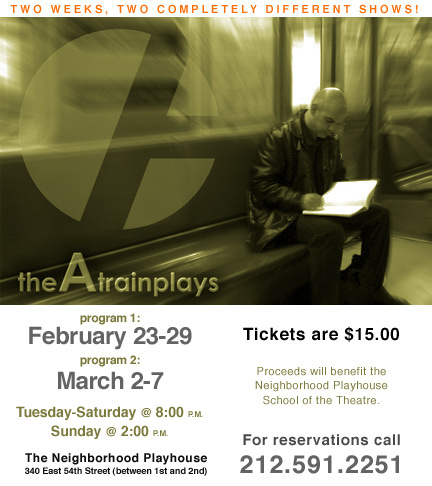 theAtrainplays, Volumes 12 and 13 from February and March 2004. My play FREE was written for Volume 12, and went on to be produced in theAtrain(re)plays and at the City Theatre in Coral Gables, Florida. 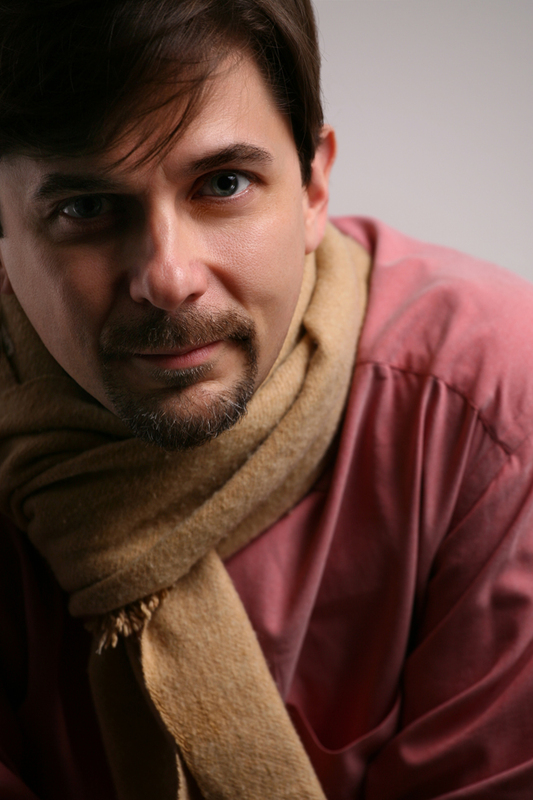 It was also named a finalist for the Heideman Award from the Actors Theatre of Louisville. Another overseas production, MONTHS ON END in Wagga Wagga, Australia. 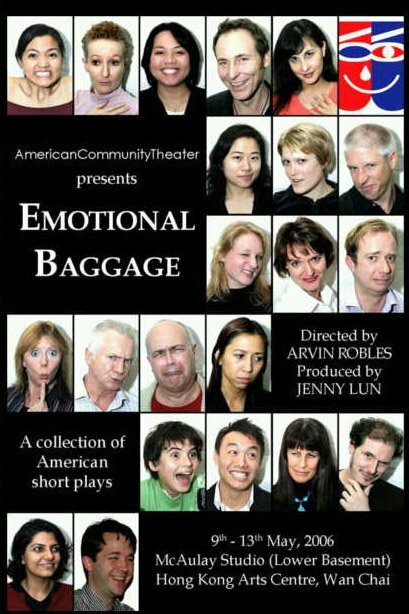 This evening of short plays in Hong Kong, produced under the title Emotional Baggage, included my Atrainplay IT'S NOT YOU. 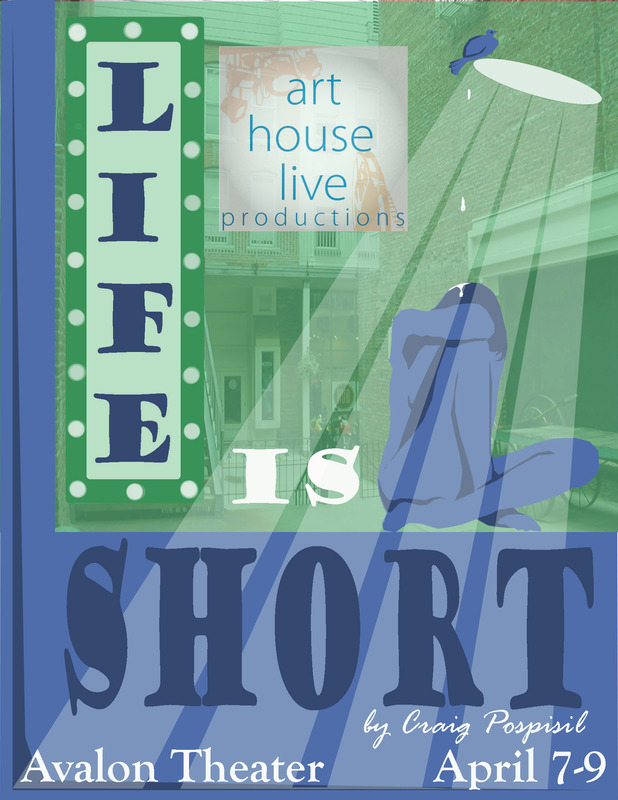 This poster is from Art House Live's production of LIFE IS SHORT in Maryland. 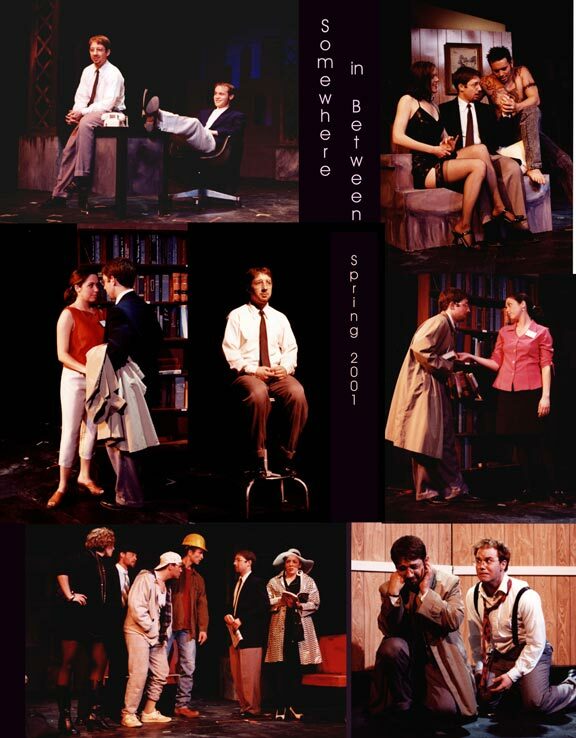 The poster for Hammond Community Theatre's production of SOMEWHERE IN BETWEEN in April 2011. And here's a poster for SOMEWHERE IN BETWEEN from Miner's Alley Theater in Colorado. 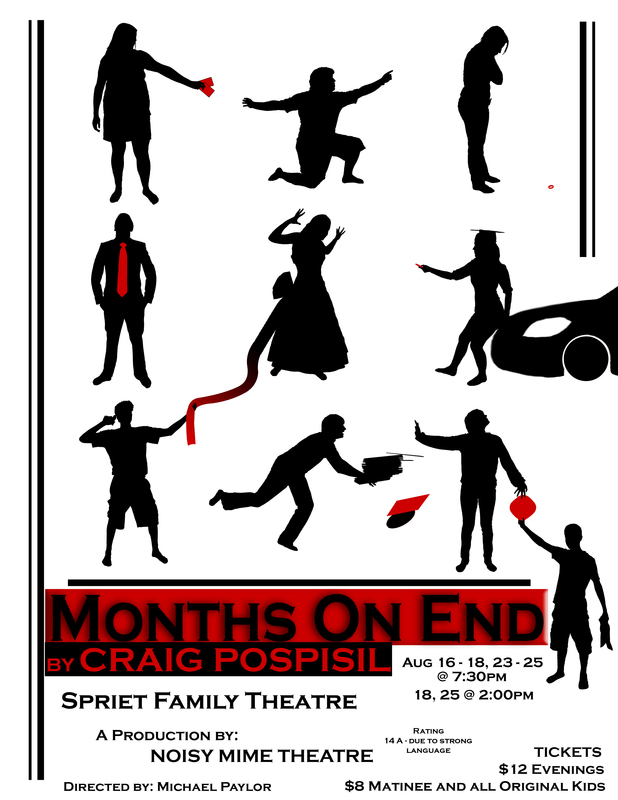 The poster for MONTHS ON END from the Spotlighters Theater in Baltimore. I was one of the featured artists at the 17th annual Last Frontier Theater Conference in Valdez, Alaska, and we performed in readings from our own works at the start of the conference week.